Leaves: Basal, sessile, simple, linear, blades 3-8, 8 to 24 inches long, .2 to .8 inch wide, blade margins entire. Inflorescences: Racemes, terminal, 8 to 20 inches, 10-50(-90)-flowered; sterile bracts 0-3(-5), bracts subtending flowers shorter than or equaling pedicels; fruiting pedicels mostly spreading-erect, .3 to 1.2 inch. Flowers: Flowers radially symmetric, spreading; tepals 6, petal-like, distinct, light blue to white, lanceolate to oblanceolate, .28 to .6 inch; stamens 6, filaments distinct. Fruits: Capsules, pale green to light brown, nearly globose, .25 to .4 inch; seeds black, .08 to .16 inch. Uses: Camas bulbs were an important food staple of Native Americans. The bulbs were eaten raw, baked, roasted, boiled in soups, or dried for winter use. 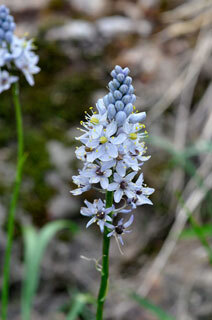 Comments: Camassia, Shoshone name camas or quamash and scilloides, genus Scilla + similar to.